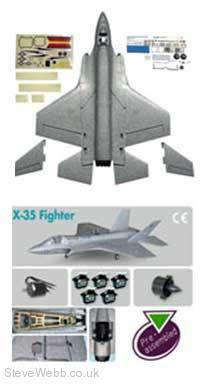 The X-35 Fighter is a real looker and is now available at Steve Webb Models and ServoShop! Although the manufacturer recommends a 30/35 Amp ESC for this aircraft, we have found that depending on the battery used and flying conditions it is difficult to adequately cool an ESC of this rating. Following many flights with our own models we would recommend a 40 to 50 amp ESC on a 3 Cell Set Up and if using the 4 Cell Turbo Motor and TWM Fan we recommend a 60 to 70 amp ESC. As with all final fix motor installations you should check the ESC used is adequate for your individual set up. Requires : 5-channel mixing radio. EPO is notorious for being difficult to get a good glued joint. From our own experience we recommend Bob Smiths Super Gold or Gold Cyno or Multiplex Zacki adhesive. Many standard forms of Cyno adhesives can also be used, but we always advise testing unknown glues on scrap foam before committing them to use.